Bayern Munich manager Jupp Heynckes claimed his side put in a "gala display" against ​Borussia Dortmund on Saturday as the Bavarians cruised to a 6-0 win over their Westphalian rivals. Bayern were denied the chance to lift the ​Bundesliga title at the Allianz Arena due to Schalke's victory earlier in the day. 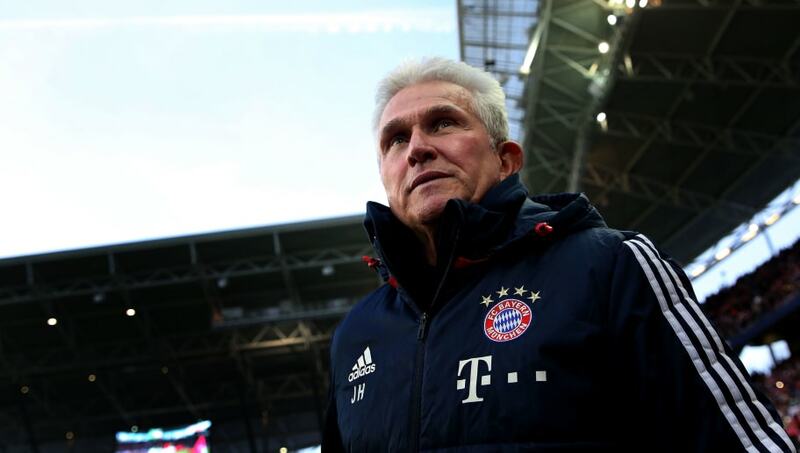 However, Heynckes' side will win a sixth straight league trophy with victory in Augsburg next week. "It's always difficult to recover your rhythm after an international break, we did a very good job," Heynckes told Bayern's official website. "Our plan was to win the game because we had to lay down another marker. "The team turned in an outstanding display over 90 minutes, they turned in a gala display in the first 45 minutes. We made the most of our tactical and technical dominance." Goals from Daniel Caligiuri and Guido Burgstaller for ​Schalke earlier on Saturday ensured that ​Bayern wouldn't get their hands on the league title after Der Klassiker, but the reigning champions can still lift the trophy in hometown Bavaria next week with a short trip to Augsburg. Before that, Heynckes and his side visit the Ramón Sánchez Pizjuán Stadium to take on Sevilla in the Champions League. The Nervionenses will be low on confidence after throwing away a two-goal lead against Barcelona this weekend.